Thousands of anti-Israeli demonstrators marched after Friday prayers in Istanbul in an angry protest at the decision of US President Donald Trump to recognize Jerusalem as the capital of Israel, an AFP correspondent said. Chanting slogans including "Jerusalem is ours and will remain so!" 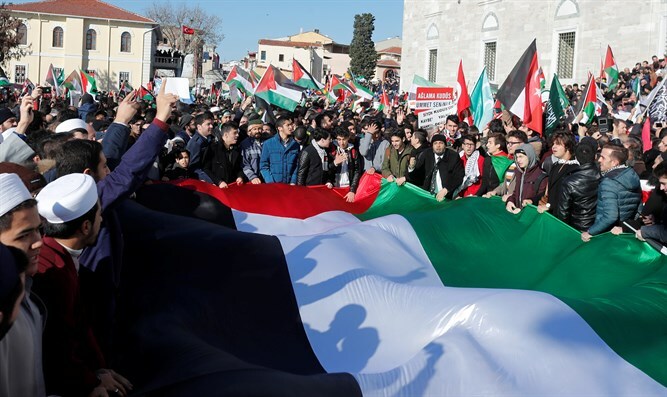 and "down with America, down with Israel", the protesters marched after prayers at the Ottoman Fatih mosque in the center of Istanbul, the correspondent added. Other protests were planned elsewhere in Istanbul and across Turkey on Friday. "We consider Jerusalem as the bastion of the Muslim community ... We are here to show our unity and our strength. Nobody can deter us," said protester Doguhan, 17. Merve, a student, said she and her colleagues had left their classes to attend the protest, describing the US decision as "null and void". "What Trump says is empty words and means nothing to us. Whenever we see the name of Israel on a map, we cross it out and write Palestine," she added. Turkey's President Recep Tayyip Erdogan has taken a hardline against the move and called an emergency summit meeting of the Organization of Islamic Cooperation (OIC) on December 13 in Istanbul. Earlier this week, Erdogan threatened to sever ties with Israel if the US recognized Jerusalem as Israel’s capital city. Last year, Turkey and Israel ended a rift triggered when Turkish supporters of the Hamas terror group attempted to run Israel’s security blockade of the Gaza Strip. After Israeli troops who boarded the blockade runner were attacked by those aboard the ship, they opened fire, killing 10 of the assailants. The two sides have since stepped up cooperation, particularly in energy, but Erdogan, who regards himself as a champion of the Palestinian cause, is still often bitterly critical of the Jewish state.